Upto11 is a new company dedicated to helping music fans discover great new music that is relevant to the way they listen to and collect music. It is a recommendation service, you can search your favorite singer,song, or album, and it will show you some relative detail of the subject. 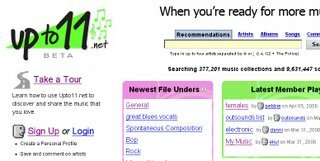 It also gives you some popular on-line music store links like Amazon, iTunes, and MSN for you download. You can join its community, and post your comments. Musicstrands is another music recommendation website. 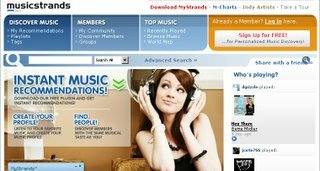 It helps people discover and organize music, and share their tastes in music with others online.